We had David Tanis's Tunisian Meatballs for dinner the other night. Tanis is one of my favorite chefs...and I love the cookbook in which this recipe is found...but for some reason I hadn't made them in a while. Since I am teaching them in an upcoming class, I thought it would be a good idea to make them again. It isn't as if I need a refresher course in cooking these meatballs, but having the recent tactile experience of making something always reminds me of things I want to say during a class. 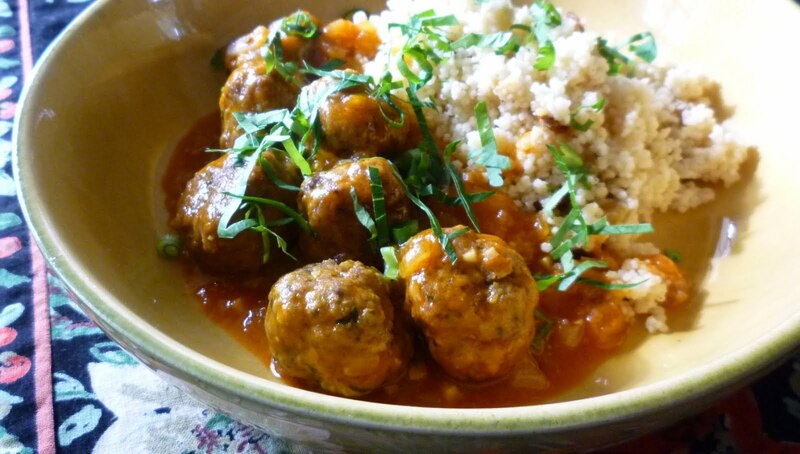 As I made them, I was struck anew with what a fantastic recipe this is for meatballs. I appreciate this recipe for many reasons: The balance of spices is just right... gently evocative of another place. They are not too hot...nor are they too mild. And the saffron and tomato cooking broth is subtle, fragrant and flavorful. The dish is particularly nice with couscous (one of my favorite side dishes). But more than anything else, I love this recipe because it contains the bones of a great basic recipe for meatballs—it gets the balance of ground meat to egg to bread to salt just right. Too much bread and a meatball will be mealy and soft rather than meaty. Too little and the meatballs will be dry...and possibly hard. Too much egg and they will be rubbery... not enough and they will have a tendency to fall apart. If you have tried a lot of recipes for meatballs, you know that getting the balance right is not a given. 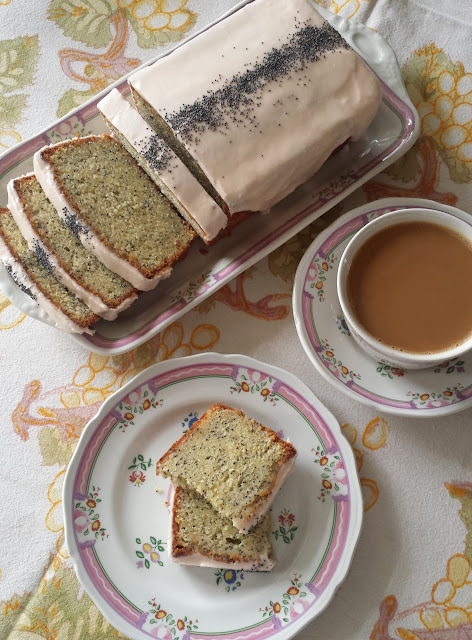 Since happening upon this recipe a few years ago, I have used the ratios in this recipe to "repair" a couple of recipes that have good flavor, but inconsistent textural results. I have always made this particular recipe with lamb, but I am certain they would be delicious made with beef. Just make sure that you are using a meat that is about twenty percent fat. 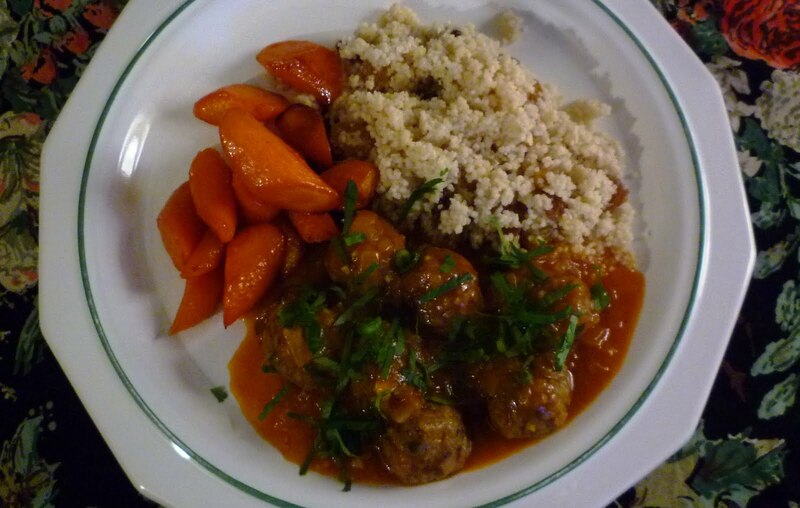 A cut with less fat will tend to produce dry, hard meatballs. If this amount of fat seems decadent to you, consider this dish (or any meatball dish) an occasional splurge where the extra fat is totally worth the tender, juicy, flavorful result. As you look at the recipe, don't be put off by the length of the ingredient list. 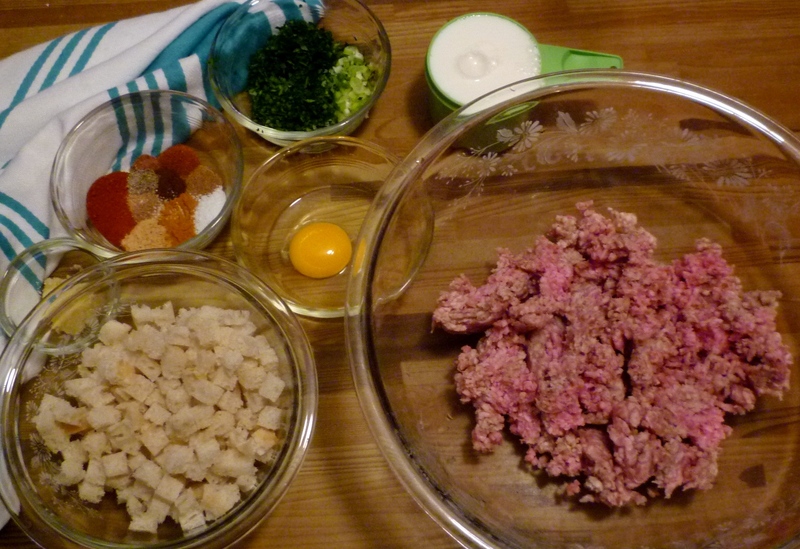 As Tanis points out, you can organize your work by making the sauce and/or the meat mixture ahead. And even if you choose to make all the components and finish the dish in one session, once you have all of the spices measured out...and the herbs chopped...the meat mixture is very quickly and easily put together. 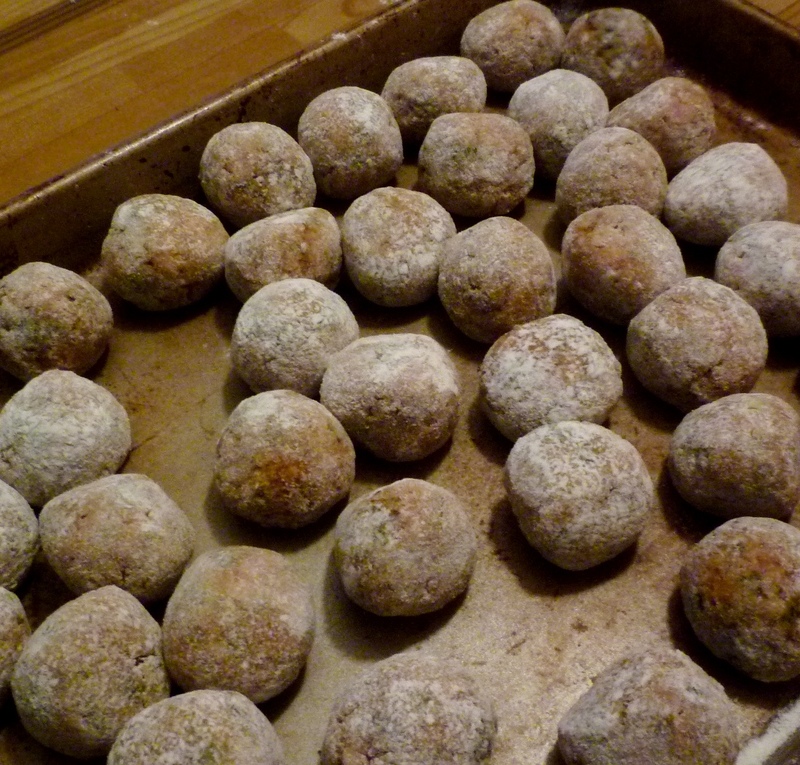 Furthermore, as with almost every recipe for meatballs in sauce, these freeze beautifully. If you take the time to make a large batch, you can freeze it in portion-sized packets. Then, on some future night when you are tired and busy, you will be able to enjoy the luxury of a slightly labor intensive dish...without having to expend any labor at all. To make the sauce, heat the oil over medium-high heat in a wide, heavy bottomed saucepan. Add onion and cook without browning until softened, about 5 to 10 minutes. Add garlic, tomato paste, cinnamon stick and saffron, and stir well to incorporate. Season generously with salt and pepper, and allow to sizzle for 1 minute more. Add broth, bring to a simmer, and simmer gently for 10 minutes. Remove from the heat. The sauce may be made up to a day in advance and refrigerated. To make the meatballs, put bread cubes and milk in a small bowl and let the bread soak until softened, about 5 minutes, then squeeze dry and transfer to a medium bowl. Add the ground meat to the bread and mix gently with your hands, then add the egg, garlic, salt, pepper, paprika, ginger, turmeric, cumin, cayenne, cloves, coriander and nutmeg. Mix well with hands to distribute seasoning. Add the parsley, cilantro and scallion, and knead for a minute. The mix may be prepared up to a day in advance and refrigerated. With your hands, roll mixture into small balls about the size of a quarter. Dust lightly with flour. Heat a quarter-inch of oil in a wide heavy skillet over medium-high heat. Fry meatballs, turning once, until barely browned, about 2 minutes per side. Transfer to a wire rack set over a tray lined with a double layer of paper towels. Add the meatballs to the sauce, bring to a simmer over medium heat cover and cook for about 20 minutes, until the sauce has thickened slightly and the meatballs are tender. Taste the sauce and adjust the seasoning, adding salt or cayenne as necessary. Garnish meatballs with remaining parsley, cilantro and scallion. 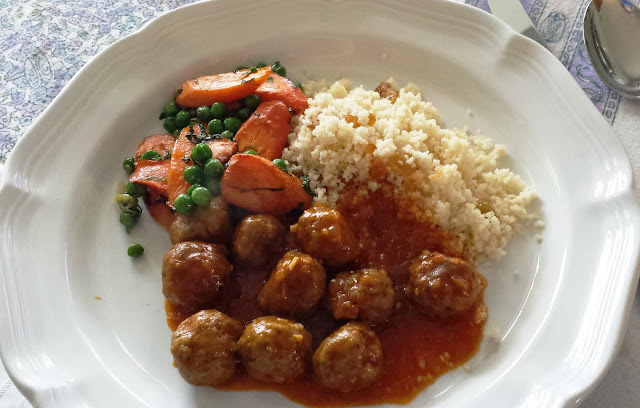 Serve with couscous or rice. Serves 4 to 6. 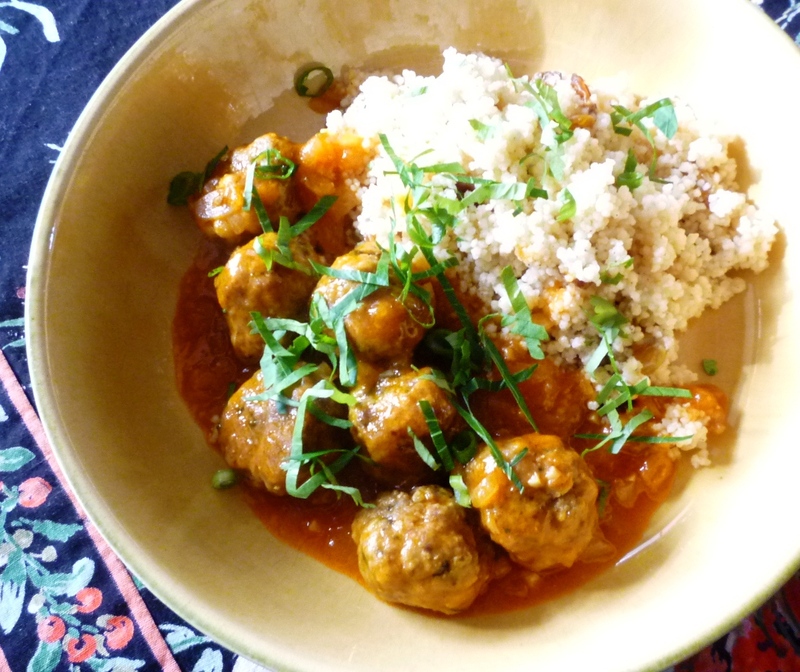 I have made this recipe and formed very small meatballs (about 10 to 11 grams each and about the size of a quarter as Tanis directs) and also in a slightly larger size (about 15 grams each) without any reduction in quality or finesse (although, I prefer the smaller ones). If made into the very small size you will have about 60 meatballs. You will have 40 to 45 in the larger size. Both the sauce and the meatball mixture can be made a day ahead. Store covered in the refrigerator. As mentioned in the text, the ratios of this recipe produce a particularly fine meatball. You can use these ratios to improvise your own meatball recipe...or repair a recipe that has nice flavors, but in which the texture of the meatball leaves something to be desired. For every pound of meat, use 1 egg, 1 t. kosher salt, and 1 1/2 cups cubed firm white bread (soaked in milk and squeezed dry).